Zen's father, Zhi Zun was the Commander of the Hong Wu Troupe. He was responsible for protecting the safety of the Emperor with his expertise in martial arts. The story began from an ordinary training day for Zen. Zen was training very hard, hoping that one day he would be as powerful as his father. One day, Zhi Zun sent his capable assistant, Aide, to train his son. After a long period of training, Zen returned home thinking that his skills had improved significantly. However, he could not find any signs of Aide and his father at home. At that instant moment of his panic, Aide appeared with serious injuries. Aide did not tell Zen what had happened but asked him to run away immediately. Zen was so worried about his father that he rushed out and started shouting for the latter. While Zen was out looking for his father, he discovered that the Palace was in total chaos. Suddenly, he heard sounds of a huge fight in the distance, and ran toward the source, thinking that his father would be there. Upon reaching the scene of combat, Zen saw his father fighting a figure that looked like the Emperor. The Emperor seemed like he was being controlled by an unknown dark force. After an exchange of blows, the Emperor realized that Zhi Zun was too powerful. At that very moment, he saw Zen running into the battle. Thinking that Zen was a better target, the Emperor targeted him instead. Seeing that his son's life was in danger, Zhi Zun used himself to shield Zen from the Emperor's attack. The Emperor's attack injured Zhi Zun severely, and Zhi Zun could not continue with the battle. Realizing that his son was in a grave situation, Zhi Zun ordered Aide to escape with Zen. Knowing that Zen was unwilling to leave without his father, Aide had to lie to Zen that Zhi Zun would be joining them later. It was upon hearing this that Zen agreed to leave. When they reached the boat, Aide confessed to Zen that Zhi Zun had died during the fight and tasked her to give a chest to Zen. Aide said that within the chest, Zen will be able to obtain the power needed for revenge and that it was up to him to keep it safe. As the boat sailed away, they encountered a horrible storm in the sea and the boat almost sunk. Luckily, they ran into Kyrin and she rescued Zen and Aide. Strength (STR): Strength measures how physically strong your character is. The higher your Strength, the more damage you'll do when hitting a monster at close range. For a Cannoneer, higher STR means doing more damage with the hand cannon. Most of your Ability Points should go into STR, and DEX will be your secondary attribute. Dexterity (DEX): Dexterity is a measure of how nimble and agile your character is. A high DEX increases your accuracy and greatly increases the damage done by ranged weapons. As a Cannoneer, this will raise the damage of your cannon balls as well as assist the accuracy of your shots. Pro Tip: If you make a mistake allocating your Ability Points, you can reallocate them by purchasing an AP Reset Coupon in the Cash Shop. Taiwan MapleStory (TMS), China MapleStory (CMS) named them as Dragon Warrior. MapleStorySEA (MSEA) named them as ZEN. With high dexterity and mobility, Jett uses guns and the extraterrestrial technology she salvaged in her bounty hunting days to obliterate those who stand against her. She also retains a tiny fragment of the core that can be equipped and upgraded to allow her to use a powerful buff skill that provides variable stat boosts to her and another character. Once you work your way through the prelude, you will begin your Jett career at level 10, with the first job advancement already complete. You can accept and complete the quest for the second job advancement at level 30 from Kyrin, and again at level 60 for the third job advancement. At level 80, Jett will receive some very important quests that must be completed before she can proceed with her fourth job advancement quest at level 100. With the launch of the ZEN class, a new core system have been implemented which is relatively unique to them. The Core System allow ZEN character to share the ability with any other character similar to the Mercedes “Elven Blessing” but what make it special is that these core system of ZEN can be modified. 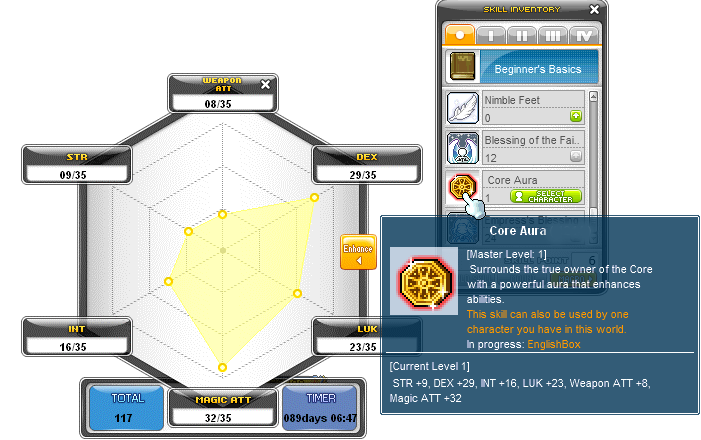 The core stats can be modified and share to another character as shown in the picture. The ability to freeze the current core stats for 30days upon each consume. The core stats can only be freeze for a max of 365 Days. The core system will be unlocked upon any usage of “Supernova Dust” and “Condensed Supernova Dust”. No reimbursement will be made for any accidental modification to the core stats which cause the “Stellar Cosmic Dust Solidifier” to lose it effect on the core systems. The ability to re-config the core stats and have a chance to increase it tier. The max stats tier is capped at 35 per stats. Although Supernova Dust have the ability to increase a stats tier, it also have the ability to drop the stats tier back to the basic (This effect will happen randomly). The core stats will be reset to default once the timer is up, please ensure that you have use “Stellar Cosmic Dust Solidifier” to freeze the stats. No reimbursement will be made for failure to freeze the stats and resulted in the lost of the core stats. NEW Only a “Completed Core” (Level 120 Core) will have a chance to have its tier increased. The ability to re-config the core stats without affect the core tier. Mainly used for after the highest tier, so as to re-config the stats without affecting the core tier. The ability to turn the core stats in the clock-wise direction once. Descriptions: Permanently increases Accuracy, Maximum Speed, and Jump. Descriptions: Increases critical hit rate and minimum critical damage. Descriptions: Step forward, unleashing a powerful hit with your fists. Descriptions: While jumping, flip forward in the air, traveling a short distance. The higher the skill level, the further you jump. Push the Jump Key to activate. At Master Level: Gun Mastery: 90%，Explosive Damage: 120%. Skill Required: Level 20 Gun Mastery. Master Level: 30. Descriptions: Increases the stats of all party members. Descriptions: Cures all abnormal status. Epic Adventure: MP Cost: 100, Duration: 60 sec, Damage: +10%, Max Damage: +5000000, Cooldown: 120 sec, Only applies to Explorer Classes within the party.